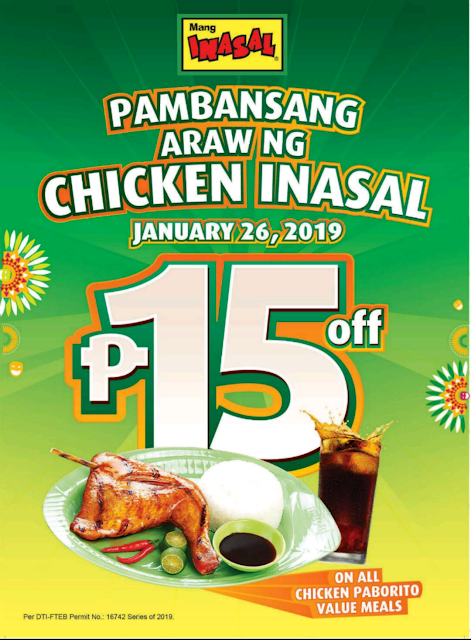 "It’s our treat for solb eaters out there – those who love to indulge in Mang Inasal Chicken Inasalthe way they want to – that is, with their bare hands, with unli rice, or doused with their favorite mix of condiments. They can enjoy the 2-in-1 sa Laki, Nuot sa Ihaw Sarap Chicken Inasal with their family and friends at an even greater price for one day only,” said Mang Inasal Brand Manager Schubert Quilinquin. Bakit hindi ko nalaman ito ng mas maaga! Hehehe sayang yung 15pesos off! My 14month old loves chicken!